2010 Kicking Camp Schedule Announced! I'm proud to release our 2010 Kicking Camp Schedule. This year we will be having kicking camps in California, Arizona, Texas, and New Jersey. I’m proud to release our 2010 Kicking Camp Schedule. This year we will be having kicking camps in California, Arizona, Texas, and New Jersey. I may be adding 2 or 3 more camp dates for late Spring and late Summer, so please continue to check on the website for new dates. I’m anticipating adding 1 date in Ft. Lauderdale, Florida and 2 dates in Orange County, CA. If you have any questions about our kicking camps or if you would like to schedule private kicking lessons in San Diego, CA or Orange County, CA, please contact me- Coach Brent at 512-817-1333. Best Wishes for a very successful 2010 Kicking Year! great prizes for competition winners from Athlete’s Performance, Wizard Kicking, Coreshorts, and Athletic Quickness! 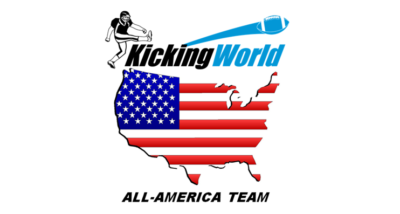 Go To www.kickingworld.com for a ton of info about our camps, typical itinerary, Q+A, FAQs, and Testimonials from Students & Parents!